" Hi Mr. Lim, A few words for my satisfaction, this upgrade parts are really good....." said Arif DML of Jakarta, Indonesia after he has upgraded his RP6 with most of my accessories. I am glad to hear that he is happy with the upgrades! "At last, the assembling process and cartridge setup are done. Regardless which cartridge I used (exact 2 or ortofon 2m black), My Rega RP 6 is really in different level than it used to be. Background sound disappear, so quiet now. High, mid, and low are more accurate. The soundstage and transparency are much better. These upgrade parts are really worth the money. I basically buy everything that Mr. Lim have except the acrylic platter (I owned it already). I am worry at the beginning that the setup will be difficult but it turn out quite easy. I have sent some photos of my new turntable. :)"
Take a look at Jorge's Rega upgrades in stages ! Now it's a completely new Rega TT with triple pulley with 3 silicone belts plus etc...etc... ! I have managed to install all the upgrades and I am very happy with them. Dinamycs, firm and no bloomy bass, nice midrange and absolutely no noise. The soundstage has become wider and more 3d like. I am stunned. I wanted to send you my results regarding the triple belt upgrade. I am very please with the results! I’ve sent along some photos, and I’ve added captions to describe the installation. A. Three belt fully installed. 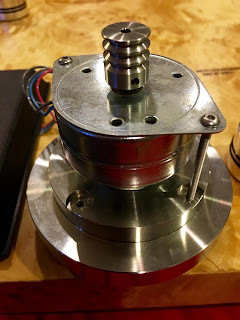 Removing the two belt pulley was very easy as I already had a two belt fully installed on the Motor Isolation Base and simply used the hex nut tool. B. Positioning the pulley/isolation base under my plinth took a few adjustments so I could assure proper belt alignment with the sub-platter. It was necessary to add an additional washer to the motor isolation base to adjust for the dfference of height of the 3 belt pulley. C. Positioning the pulley height took some final adjustments once in place, but that was quite easy using the hex nut tool. As can be seen in my photo the belts align perfectly with the sub-platter! 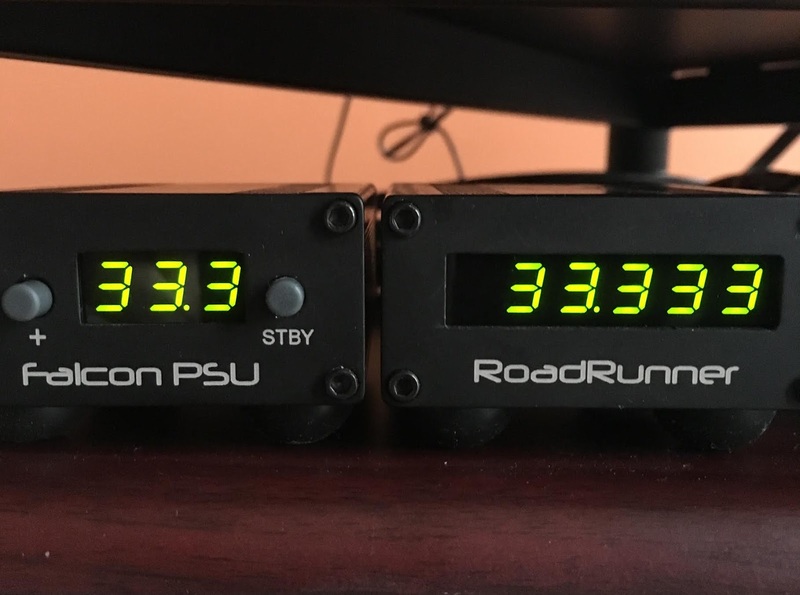 D. I am able to see the results of the addition of the 3 belt pulley immediately using my Falcon Industries PSU and Road Runner Tachometer. As can be seen the 2nd and 3rd decimal places are showing great accuracy. Falcon states that a tuned TT will show a stable second decimal place with the 3rd fluctuating. However we are talking about some very small values here! When I had the two belt pulley on the tach the stability was good but the tach always showed a constant varience in the second and third decimal place. So the addition of the 3 belt pulley shows measurable benefits immediately. However good test results and numbers are there is only one thing that makes any upgrade worthwhile and that is, does it make your TT sound better? In this case the triple pulley upgrade did just that! I’ve been listening to a lot of solo violin pieces as well as solo piano and female voice passages and the differences are not subtle. The sustain of the notes and pitch stability are excellent! The music just sounds that much more life like and musical. I was a bit skeptical about how much a benefit adding the 3 belt pulley would be, however I am a convert now. Just like any other upgrade it adds noticeable improvements. All in all I am quite pleased. This upgrade would be worth it for users of the isolation motor base or one’s using the standard Rega motor mount. Thank you Michael for providing us with yet another awesome upgrade product! 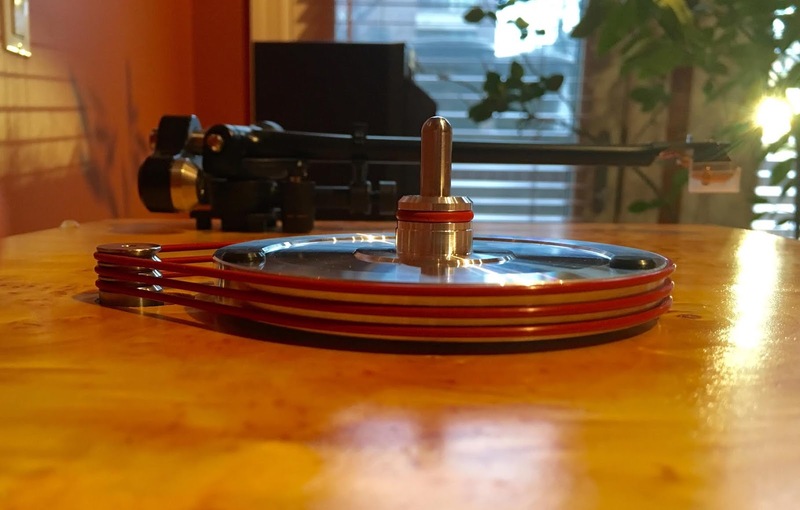 Many turntable enthusiasts have been requesting for an adjustable VTA adjuster from me. This issue has been in my mind for some time and finally I have got one for you here today. This adjustable VTA adjuster retrofits 1"( 25mm) diameter for tonearm hole (e.g Rega turntables). As many models of Rega turntables like P1/RP1, P2, P3-24 and RP3 spot 25mm diameter tonearm holes on board, so this vta adjuster is compatible with your RB300/250/RB600 tonearms. However, you may have to file a little of the phenolic bracing hole should it not in perfect alignment with the tonearm hole. What about other models of turntables? For turntables with 26mm diameter holes (e.g most of the older Planar 3) the installation is straight forward and easier in this case. 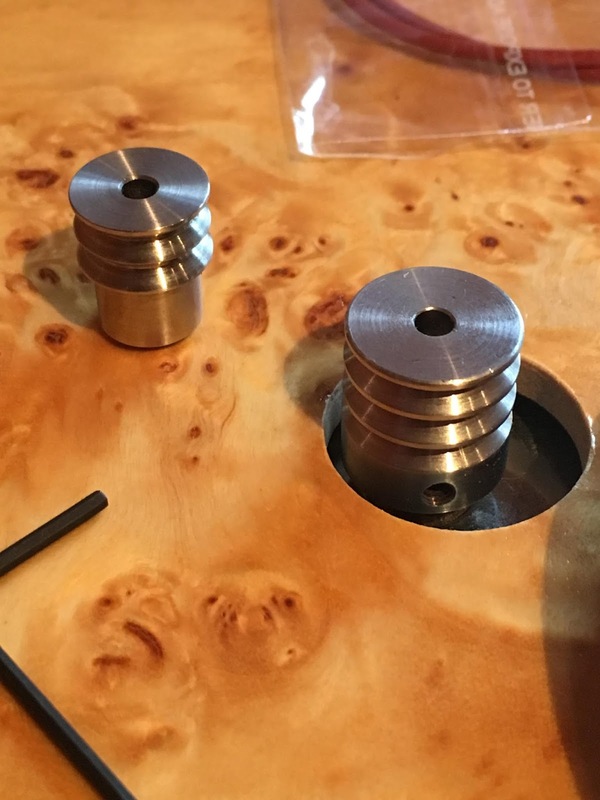 There are also some later models with 24mm diameter holes and clearly a little filing with a semi-circular file is necessary to install this adjuster. To file the circular hole from 24mm to 25mm is quite a simple job which can be done in 10-15 minutes. *Try to file 0.5 mm of board along the circumference as even as possible to increase the hole diameter to 25mm or slightly larger. Make sure the vta adjuster just fit nicely into the hole. 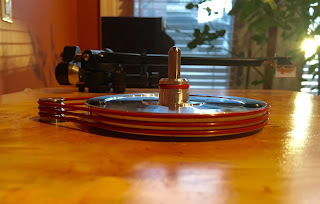 Note: for RB250 tonearm you have to remove the plastic sleeve above the thread to expose the brass body like the RB300 in order to fit the vta adjuster.